The Vast Majority of Celiacs Are Not Healing on the Gluten-Free Diet – Going Gluten-Free. Most doctors will tell you that the best-known cure for celiac disease (CD) is the gluten-free diet (or GFD in medical literature). But sometimes patients don’t get better, even when adhering strictly to the diet. Or they may initially feel better, but then symptoms recur months or even years later. Is this because celiacs are not healing their guts? People who don’t get better on the GFD, or who relapse, are said to have Non-Responsive Celiac Disease (NRCD). Even without a diagnosis of NRCD, many celiacs continue to have digestive complaints and other health complications, even though they may have improved somewhat after going gluten-free –. This leads to a decreased “quality of life” as compared to non-celiacs  . Sadly, many take it as gospel that if you have celiac disease, you are destined to suffer in one capacity or another for the rest of your life. I honestly don’t believe it has to be this way! Could these symptoms be because people aren’t truly healing their guts on the conventional gluten-free diet? And if we can get the gut to truly heal, can we reverse many of these life-long complaints and co-morbidities? While refractory celiac disease is commonly defined as non-responsive celiac disease with both persistent symptoms and persistent mucosal damage  , some believe that this definition is “unsatisfactory”  and others believe the definition could be revised to also include non-responsive celiac disease with persistent damage, even without symptoms . If that’s the case, RCD may be much less rare than once thought. And it is likely that “mucosal recovery is the only protection against such complications .” Obviously, healing your gut is of utmost importance! So just how many celiacs aren’t responding to the gluten-free diet? Well Dr. Alessio Fasano says that only 10-15% of his patients are not responsive , while Lanzini et al. say that a whopping 92% of celiacs on a gluten-free diet are not responsive . That’s a huge difference! How can there be such a wide spectrum in percentage of response rates? There are three ways doctors and researchers are measuring response to the gluten-free diet. In Dr. Fasano’s case, only 10-15% of his patients’ symptoms do not improve on a gluten-free diet. This is a clinical response to the GFD. That is, the symptoms that brought most of his patients to see him in the first place (e.g. diarrhea, brain-fog, etc.) have improved since adopting a gluten-free diet. In general, a patient feels better. So since clinical response is not enough, how else do doctors assess whether or not you are healing? At your follow-up appointments, often doctors will check for antibodies to tTG and gliadin (tTG-IGA and AGA IgA) and maybe EMA, to see if there has been a response to the gluten free diet (for more explanation on what those tests actually are, please see: What is the Difference Between Celiac Disease & Gluten Sensitivity?). If the tests come back negative, then many doctors will tell you that you have a good serological response to the diet. However, this is simply not true! Numerous studies have shown that just because you don’t have antibodies to tTG (or EMA) does not mean that your intestinal lining has healed – ! Negative results for antibodies to tTG can be a good indication as to whether or not you’ve been sticking with the gluten-free diet, though –. Some researchers are anticipating that tests for antibodies to deamidated gluten (anti-DGP), that is, antibodies to fragments of gluten that have already been digested, may be useful in detecting mucosal recovery . However, not everyone agrees with this . So until there is agreement, neither clinical nor serological tests can substitute for intestinal biopsies in assessing the true extent of recovery . I keep wondering why the gluten-free community is not talking more about this. Now, this post isn’t meant to present a doomsday scenario and make you feel that all hope is lost. Just the opposite. I want you to be informed, and to take a look at the fact that the gluten-free diet, as we know it, is not really helping people. Yearly biopsies after that are also recommended. Those who have healed on the gluten-free diet have taken from 2 to 5 years to achieve mucosal recovery after starting the diet, although it can happen in as little as 6 months. Which is why repeated biopsies are recommended. Unfortunately, though, there are a couple of big drawbacks to the periodic follow-up biopsies. Namely, they are costly and they are also “inconvenient” to the patient. So they are not currently a recommendation of many medical associations  and unfortunately, rarely performed . This makes it difficult to say with confidence whether or not a patient has truly healed. If you are not getting follow-up biopsies, you might still know the answer as to whether or not you are healing, though. If you have any lingering health concerns, even if your digestive issues have cleared up (because we know that gluten-related issues can present outside the intestines with no correlating digestive symptoms) , then there’s a good chance that you haven’t completely healed yet. And if that’s the case, its time to resort to treatments beyond the conventional gluten-free diet. So why aren’t people healing on the gluten free diet? One likely possibility is because 32% of inherently gluten-free grains are cross-contaminated with more than 20ppm of gluten . This means that if your buckwheat or millet or quinoa is not labeled gluten-free, don’t assume it is! But even the smallest amount of gluten may not actually be safe, so even foods labeled as ‘certified gluten-free’ (which can contain up to 19 ppm of gluten) could be causing you trouble. Other reasons cited for continued villous atrophy include colitis (microscopic and ulcerative) and Crohn’s Disease, which are often found in conjunction with celiac disease –. But are these inflammatory bowel diseases the causes of villous atrophy, or symptoms of it? In addition, there’s more to wheat than just gluten that could be problematic. And because of damage to the intestines, there may be other food sensitivities at play. In fact, 50% of people who have celiac disease also have reactions to cow’s milk proteins . There may also be malabsorption to certain foods like lactose or fructose, as well as dysbiosis (when your gut is out of balance) such as small intestinal bacterial overgrowth (SIBO) and/or excess yeast (candida) in the gut. All of which need to be addressed before true healing can happen. As I’ve mentioned often, the best way to start your true healing process, is by adopting a paleo diet. A paleo diet removes the majority of top food allergens (soy, wheat, peanut, dairy), eliminates the chance of any cross-contamination from gluten by removing grains altogether, and removes other foods that cause digestive distress and inflammation (legumes, sugar). Because the very first thing you want to do, is to give your digestive tract a break, and let it begin to heal. You should also talk to your doctor about getting tested for candida overgrowth (candidiasis), SIBO, and pathogens. Most conventional doctors don’t believe in candidiasis or SIBO, so you may need to find a “Functional Medicine” doctor or alternative practitioner to have those tests performed. Its worth it. So do it. 🙂 In addition, your doctor needs to test you for key vitamin deficiencies. Is it possible for a non-responsive celiac to heal? There are many compelling anecdotal stories from people with autoimmune diseases who didn’t get better with the conventional gluten-free diet, but did get better when they adopted a paleo or grain-free diet. Here are a few of the more famous ones: New York Times Bestselling Author Robb Wolf of the Paleo Solution who beat ulcerative colitis, cookbook author Danielle Walker who also beat ulcerative colitis, cookbook author and celiac Elana Amsterdam, celiac Jordan Reasoner from the SCD Lifestyle, and probably the most amazing story of all Dr. Terry Wahls, who triumphed over multiple sclerosis. This is just a handful of the many stories out there, where gluten-free wasn’t enough, but the right diet was. Still, no matter how compelling, if you are like me, you would love to see some cold, hard facts to back up the benefits of the paleo diet, too. Unfortunately, not much medical research has been done on the paleo diet and its effect on celiac disease or other autoimmune disorders. The paleo diet has been shown to be good for acne, weight loss, heart health and metabolic syndrome, though, so at least we can say we know it is beneficial to human health overall –. Also, unfortunately, very little research has been done on grains other than wheat, with the exception of oats, whose safety is still being hotly debated. There has been one study that showed toxicity to corn in some celiac patients , and there has been another study showing that rice can cross-react with glutenin antibodies . We are also now aware of toxicity to other parts of wheat beyond gluten, such as the lectin, WGA, and wheat amylase trypsin inhibitors (ATIs), which are naturally occurring pesticides in the plant . But otherwise, most of the attention has been focused only on the gluten part of wheat, and usually gliadin at that. However, an interesting study was done by Hollon et. al in 2013 , of which Dr. Fasano is also a co-author. The study looked at a group of people who did not heal on the conventional GFD and asked them to go on what they called a Gluten Contamination Elimination Diet (GCED), which was a mostly grain-free diet, in an effort to remove any chances of being cross-contaminated by trace amounts of gluten. Only white and brown rice were allowed. In addition to removing most other grains, the diet also removed most processed foods, which could also contain trace amounts of gluten. And what was the response rate? 82% of patients on a (mostly) grain-free diet responded well to the treatment (clinically and histologically). Personally, I wonder if even more people might have healed if rice were removed, since, as already mentioned, we know that rice can be problematic for some, too. Not quite as impressive, but still of interest, Sharkey, et al. (2013) proposed a diet free of wheat starch, barley malt and oats, all of which are considered acceptable on a GFD in the UK, as well as free of any trace amounts of gluten. Their results showed that 50% of non-responders were able to achieve mucosal recovery after adopting the diet, which shows that foods labeled “gluten-free” may still be problematic for celiacs. 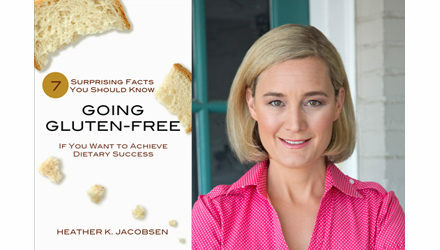 So whether you want to call it a “gluten-contamination elimination diet,” a grain-free diet, or a diet free of processed foods, there is some proof that eliminating more than just gluten can actually help non-responding celiacs heal! A diet of fresh, whole foods that are minimally processed, and completely free of wheat (no foods containing wheat starch or other “de-glutened” components of wheat), is a good starting point for the celiac or gluten-sensitive who still has not achieved optimal health. It is not clear how long one needs to remain on a grain-free diet in order to achieve healing. Several patients in the Hollon et al. study returned to their conventional GFD and did not report any complaints (as of the date of the study), but several tried to revert back to the conventional GFD and experienced a relapse in symptoms. These patients were not checked for histological responses after returning to the GFD, so we don’t know for sure what the effects of returning to the conventional gluten-free diet really are. Whether its grain-free for life, or just until mucosal recovery is achieved, still remains to be seen. If you are newly diagnosed with celiac disease, please don’t despair. I know it’s a lot to take in, in the beginning. But after one month of a grain-free/paleo diet, you will get used to a new way of eating, and most likely will so enjoy the feeling of being a whole, new gluten-free you that you may never want to go back to the way things were before. And trust me, a foodie at heart, when I tell you that you will still be able to eat delicious, satiating meals. You just may have to think about eating in a way that is different than what you are used to. Many people have paved a path ahead of you already, so you won’t be alone when you’re ready to get started on a grain-free diet. Matysiak-Budnik T1, Malamut G, de Serre NP, Grosdidier E, Seguier S, Brousse N, Caillat-Zucman S, Cerf-Bensussan N, Schmitz J, Cellier C. Long-term follow-up of 61 coeliac patients diagnosed in childhood: evolution toward latency is possible on a normal diet. Gut. 2007 Oct;56(10):1379-86. Epub 2007 Feb 15. Haines ML, RP Anderson And PR Gibson. Systematic review: the evidence base for long-term management of coeliac disease. Article first published online: 30 JUL 2008. Alimentary Pharmacology & Therapeutics. Volume 28, Issue 9, pages 1042–1066, November 2008. Paarlahti P1, Kurppa K, Ukkola A, Collin P, Huhtala H, Mäki M, Kaukinen K. Predictors of persistent symptoms and reduced quality of life in treated coeliac disease patients: a large cross-sectional study. BMC Gastroenterol. 2013 Apr 30;13:75. Leeds JS, Höroldt BS, Sidhu R, Hopper AD, Robinson K, Toulson B, Dixon L, Lobo AJ, McAlindon ME, Hurlstone DP, Sanders DS. Is there an association between coeliac disease and inflammatory bowel diseases? A study of relative prevalence in comparison with population controls. Scand J Gastroenterol. 2007 Oct;42(10):1214-20. Spatola BN1, Kaukinen K, Collin P, Mäki M, Kagnoff MF, Daugherty PS. Aliment Pharmacol Ther. 2014 Feb;39(4):407-17. Epub 2014 Jan 6. Persistence of elevated deamidated gliadin peptide antibodies on a gluten-free diet indicates nonresponsive coeliac disease. Silvester JA, and R Mohsin. Long-term follow-up of individuals with celiac disease: An evaluation of current practice guidelines. Can J Gastroenterol. 2007 Sep; 21(9): 557–564. Midhagen G, Hallert C. High rate of gastrointestinal symptoms in celiac patients living on a gluten-free diets. The American Journal of Gastroenterology 98, 2023-2026. September 2003. Sharkey LM, G Corbett, E. Currie, J. Lee, N. Sweeney, J. M. Woodward. Optimising Delivery of Care in Coeliac Disease. Comparison of the Benefits of Repeat Biopsy and Serological Follow-up. Alimentary Pharmacology & Therapeutics. 2013;38(10):1278-1291. Biagi F, Marchese A, Ferretti F, Ciccocioppo R, et al. A multicentre case control study on complicated coeliac disease: two different patterns of natural history, two different prognoses. BMC Gastroenterol. 2014; 14: 139. Published online 2014 Aug 7. Rubio-Tapia A1, Murray JA. Classification and management of refractory coeliac disease. Gut. 2010 Apr;59(4):547-57. Kaukinen K, Peräaho M, Lindfors K, Partanen J, Woolley N, Pikkarainen P, Karvonen AL, Laasanen T, Sievänen H, Mäki M, Collin P. Aliment Pharmacol Ther. 2007 May 15;25(10):1237-45. 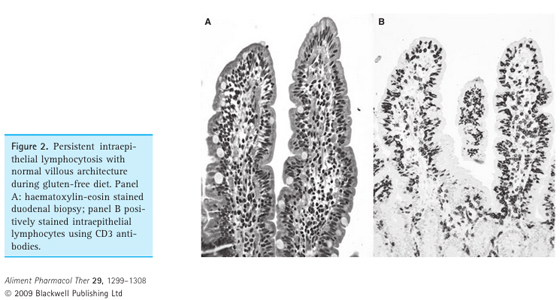 Persistent small bowel mucosal villous atrophy without symptoms in coeliac disease. Rubio-Tapia et al. 2010. April. Mooney P, K Evans, S Singh, D Sanders. Treatment Failure in Coeliac Disease: A Practical Guide to Investigation and Treatment of Non-responsive and Refractory Coeliac Disease. J Gastrointestin Liver Dis. June 2012 Vol. 21 No 2, 197-203. Lebwohl B, Michaëlsson K, Green PH, Ludvigsson Persistent mucosal damage and risk of fracture in celiac disease. JF J Clin Endocrinol Metab. 2014 Feb;99(2):609-16. Epub 2014 Jan 16. Lebwohl B, Granath F, Ekbom A, Smedby KE, Murray JA, Neugut AI, Green PH, Ludvigsson JF. Mucosal healing and risk for lymphoproliferative malignancy in celiac disease: a population-based cohort study. Ann Intern Med. 2013 Aug 6;159(3):169-75. Mulder CJ. Does treatment of coeliac disease require full mucosal recovery? Rom J Gastroenterol. 2005 Jun;14(2):147-9. Fasano A. Telephone Interview. January 27th, 2015. Published: March 24th, 2015. Murray J, Rubio–Tapia A, Van Dyke C, Brogan D, Knipschield M, Lahr B, Rumalla A, Zinsmeister A, Gostout C. Mucosal Atrophy in Celiac Disease: Extent of Involvement, Correlation With Clinical Presentation, and Response to Treatment. Clin Gastroenterol Hepatol. 2008 February ; 6(2): 186–125. Kaukinen K, Sulkanen S, Maki M, Collin P. IgA-class transglutaminase antibodies in evaluating the efficacy of gluten-free diet in coeliac disease. Eur J Gastroenterol Hepatol. 2002;14:311–5. Tursi A, Brandimarte G, Giorgetti G. Lack of usefulness of anti-transglutaminase antibodies in assessing histologic recovery after gluten-free diet in celiac disease. J Clin Gastroenterol. 2003;37:387–91. Hopper AD, Hadjivassiliou M, Hurlstone DP, Lobo AJ, McAlindon ME, Egner W, Wild G, Sanders DS. Clin Gastroenterol Hepatol. 2008 Mar;6(3):314-20. What is the role of serologic testing in celiac disease? A prospective, biopsy-confirmed study with economic analysis. Dickey W, Hughes DF, McMillan SA. Disappearance of endomysial antibodies in treated celiac disease does not indicate histological recovery. Am J Gastroenterol. 2000; 95:712–714. Webb C, Myléus A, Norström F, Hammarroth S, Högberg L, Lagerqvist C, Rosén A, Sandström O, Stenhammar L, Ivarsson A, Carlsson A. High adherence to a gluten-free diet in adolescents with screening-detected celiac disease. J Pediatr Gastroenterol Nutr. 2015 Jan;60(1):54-9. Evans KE1, Sanders DS. What is the use of biopsy and antibodies in coeliac disease diagnosis? J Intern Med. 2011 Jun;269(6):572-81. Rubio-Tapia et al. 2010. June. Fasano A, C Catassi. Current approaches to diagnosis and treatment of celiac disease: An evolving spectrum. Gastroenterology. February 2001Volume 120, Issue 3, Pages 636–651. Dewar D, S Donnelly, S McLaughlin, M Johnson, H J Ellis, P Ciclitira. Celiac disease: Management of persistent symptoms in patients on a gluten-free diet. World J Gastroenterol 2012 March 28; 18(12): 1348-1356. G Kristjansson, P Venge, R Hallgren. Mucosal reactivity to cow’s milk protein in coeliac disease. Clinical and Experimental Immunology. March 2007. 147 (3). Melnik B. Dermatoendocrinol. 2012 Jan 1;4(1):20-32. Dietary intervention in acne: Attenuation of increased mTORC1 signaling promoted by Western diet. Jönsson T1, Granfeldt Y, Lindeberg S, Hallberg AC. Subjective satiety and other experiences of a Paleolithic diet compared to a diabetes diet in patients with type 2 diabetes. Nutr J. 2013 Jul 29;12:105. Boers I, Muskiet FA, Berkelaar E, Schut E, Penders R, Hoenderdos K, Wichers HJ, Jong MC. Favourable effects of consuming a Palaeolithic-type diet on characteristics of the metabolic syndrome: a randomized controlled pilot-study. Lipids Health Dis. 2014 Oct 11;13:160. Frassetto LA, Schloetter M, Mietus-Synder M, Morris RC Jr, Sebastian A. Metabolic and physiologic improvements from consuming a paleolithic, hunter-gatherer type diet. Eur J Clin Nutr. 2009 Aug;63(8):947-55. doi: 10.1038/ejcn.2009.4. Epub 2009 Feb 11. Ortiz-Sánchez JP, Cabrera-Chávez F, de la Barca AM. Maize prolamins could induce a gluten-like cellular immune response in some celiac disease patients. Nutrients. 2013 Oct 21;5(10):4174-83. Braly J and R Hoggan. Dangerous Grains. Why Gluten Cereal Grains May Be Hazardous to Your Health. 2002. Avery. New York. p. 171. Junker Y, Zeissig S, Kim SJ, et al. Wheat amylase trypsin inhibitors drive intestinal inflammation via activation of toll-like receptor 4. J Exp Med. 2012;209:2395–2408. Previous PostWhat’s the Difference Between Celiac Disease and Gluten Sensitivity? Great Article!! At the IBS Treatment Center (https://IBSTreatmentCenter.com) we see lots of patients who have been diagnosed as celiac and have tried to go gluten free, but are still ill. There are many reasons, including cross contamination and other issues that prevent gut healing. This group of patients typically tries several different doctors before they find us. But once they do, we help them identify the underlying cause of the residual inflammation and whatever else is going on. Fortunately the vast majority are able to heal and get well. It takes a doctor willing to use go way beyond “just don’t eat gluten and you will be fine.” Thanks to Heather for talking about this important issue. Well Done Heather. You are right on the money with the clear, sequential thoughts you’ve laid out. Tremendous number of hours were put into this article. Good job. Thank you so much, Dr. O’Bryan, for taking the time to read and comment on this article. Many hours, indeed. 🙂 So, don’t you think we need to start being more vocal about the fact that today’s current GFD needs to be redefined? Very interesting. After nearly 2 years of being GF as a diagnosed Coeliac I still feel exhausted a lot more than I expected. It seems to come in waves – I’ll be ok for several weeks and then slump. I have eliminated several so-called GF grains that I know have an effect on me. None of these cause traditional gut symptoms but give me joint pains, are mood related or have an effect on my skin. As far as I am aware, I can still cope with rice – but it would be worth eliminating it to see if I feel consistently better. I’ve come to the conclusion that hardly any manufactured food that contains grains or their derivatives is safe. And I also think there’s an issue with things like ground herbs, ground spices and herb tea in teabags. Thank you for sharing your story, Judy. You should definitely find out about your herbs and spices. I know certain brands will use gluten as a thickening agent in their spice mixes, so what’s not to say it can’t cross-contaminate some of their other non-mixed spices? Also, have you considered dairy? Taking that and/or or rice out for 30 days, might give you a few answers. I hope you feel better soon!